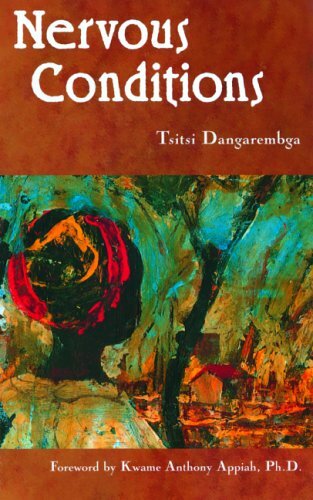 The first time I read Nervous Conditions, Zimbabwean author Tsitsi Dangarembga’s seminal first novel, I was an undergraduate student at the University of California, Davis, enrolled in a course on African womanhood (this was in 2004). The course was called “Women in Africa.” Professor Moradewun Adejunmobi taught the course and Nervous Conditions was on the syllabus, along with several other works of African feminist fiction like Mariama Bâ’s So Long a Letter and Buchi Emecheta’s The Joys of Motherhood. I began the course with a mixture of curiosity and arrogance. It was my first time taking a course that mentioned me in its title. I am an African woman who grew up in Cameroon. I once was “a woman in Africa.” I once was a girl in Africa. The class had to be about me! And because of this, I felt curious to see what the course could teach me about myself. But I also felt that I already knew a thing or two about African womanhood and wouldn’t be learning anything new. That course quickly erased my arrogance and amplified my curiosity. The books we read transformed me. I did not just read those books. I inhaled them. I consumed them as if they were pills that had the power to cure me of an illness I suffered from. I was especially taken by Nervous Conditions because, unlike the other novels assigned to us, this novel had a young woman as narrator. I emerged from that course — from those books, especially Nervous Conditions — a changed woman, a woman with a lot of questions about her life. A few months later, in my very first semester of graduate school at the University of Michigan (Ann Arbor), I enrolled in a course called “African Women” and was re-united with Tsitsi Dangarembga’s novel. I read it a second time and felt the same way I felt the first time I read it. I felt that the book was, in so many ways, about me, about my own family, about our struggles. It’s been ten years since 2004, a decade of living and learning now tucked securely in my past. Today, as I complete my third reading of Nervous Conditions, I am more convinced than ever that this book captures the essence of my life story. I am Tambu, the main character. I am telling my life story, working my mind around it and through it, trying to understand the things that have happened and are happening to me. I am the girl who is not afraid to fight with her brother, to challenge him when he tells her that he is more worthy of great things. Tambu’s voice is my voice. Tambu’s mind is my mind, trying to impose some order on all that seems senseless. I am Tambu mulling over ideas of feminine decorum and notions of decency, as well as patriarchal status differences between male and female relatives. Tambu’s long, dense paragraphs of fluid prose — narration oftentimes unpunctuated in various places, breathless, hurried — is my prose. I lose myself in Tambu’s words, and I find myself in them, at the same time. I lose myself, because I find myself. I lose my sense of being separate from the narrator. I become the women in the story. I am not only Tambu. I am every woman in her family. Their trials and tribulations are my own. I am Tambu’s cousin Nyasha. I am Nyasha asking profound and heartbreaking questions, interrogating reality constantly. I am Nyasha challenging male authority, turning patriarchy on its head. I am Nyasha confronting my father, fighting with him. I am pushing against the boundaries of women’s worlds, failing to explode those walls or transcend them, and internalizing my grief and disappointment. I am Nyasha using my mind to try to break out of the varied but similar prisons of gender, race, class, colonialism, patrilineage, and age/generation. I am looking for answers and solutions, reading countless books, becoming mired in a mental bog of facts, histories, injustices, and tragedies. I am the young intellectual immersed in a sanity-annihilating world of extreme academia and perpetual education. I am Nyasha losing her mind. I am Tambu’s aunt Lucia being bold and fearless. I am Lucia using my voice so confidently that it frightens men; I understand that a woman’s voice is a powerfully liberating instrument. I am Lucia showing that a woman owns her body. But I am also Tambu’s mother, whose body has been given over to her husband and his lineage, and whose older children have been taken away, offered up to the voracious cause of education and a financially secure future for the family. I am Tambu’s other aunt (Ma Chido, married to Tambu’s uncle Babamukuru), whose education and employment and marital status have not been able to assure her of a peaceful life or assure her daughter, Nyasha, of a life safe from physical and psychological harm. I am all these women, but I am especially the two young women, Tambu and Nyasha. I am these schoolgirls, pursuing their studies passionately. Growing my mind in the classroom and beyond, learning to think for myself. I am a young woman who, having been given the opportunity to become educated, can now prove to myself and a doubting world that I am intelligent, capable, and worthy of greatness. I must believe that I am worthy of freedom, of the chance to choose a life in which my fate is not bound to that of a man or what a man might wish for me. I am free to think and speak for myself, free to build a new way of life for myself–a life I am willing to work hard for, to slave over my books for, and beyond that, a life in which I fight to always perceive reality accurately, a life in which I comprehend the world I live in with clarity. I create a life in which I engage with the struggles of every human being, the struggles of women and Africans–struggles that are individual and collective battles for a full, authentic, and self-determining existence. I fight to be recognized as a human and to be valued as such. It is a testament to Tsitsi Dangarembga’s phenomenal literary gift that I–a woman from Cameroon — can read her book about a girl in Zimbabwe, feel that it is my story, and draw strength from it. Like the young women in Nervous Conditions, I must (as much as possible) decide what to do with my mind, heart, and body. I must chart the best paths for life. I must learn how to think for myself about men, women, power, and freedom. I must realize that education, as empowering as it may be, is no easy or uncomplicated solution to the problems of gender and social inequality. Ten years ago, Nervous Conditions compelled me to take ownership of my being, and today, it still does. I know what this means. It means that this story is timeless and the struggle for equality is far from over. Women’s words and stories can change the world. Tambu’s voice will continue to transform African women’s lives, one reader at a time. Viola Allo is a Cameroonian-born poet and essayist based in the United States. Her first chapbook of poems, Bird From Africa, is included in the Eight New-Generation African Poets chapbook box set published in 2015 by Akashic Books and the African Poetry Book Fund. Viola resides in California and writes at her blog, Letters to Cameroon.